The big news from Thursday night wasn’t so much the surprising NBA draft where the Cavs took UNLV’s Anthony Bennett with the first overall pick and Nerlens Noel, the hopelessly over-rated Kentucky beanpole, dropped to sixth overall before being traded to Philadelphia, but the proposed – and we have to say proposed because no trades can be approved until mid-July – trade between the Brooklyn Nets and the Boston Celtics. How many years do you guys have left? Boston had just lost talismanic coach Doc Rivers to the LA Clippers, a year after losing “big three” sharpshooter Ray Allen to the Miami Heat in free agency. Rivers clearly recognised what most of the rest of us had; that the three year plan that began in 2007, won a title at the first attempt, and extended in credibility until about a year ago, was over. The Celtics, to their credit overcame injuries and trades to make the NBA finals a second time in 2010, but they were well beaten in the Eastern Conference finals by the Miami Heat in 2011 before, again, coming back the following year only to lose to an inspired LeBron James performance in 2012. This past year they were very unconvincing against the New York Knicks, losing 4-2. 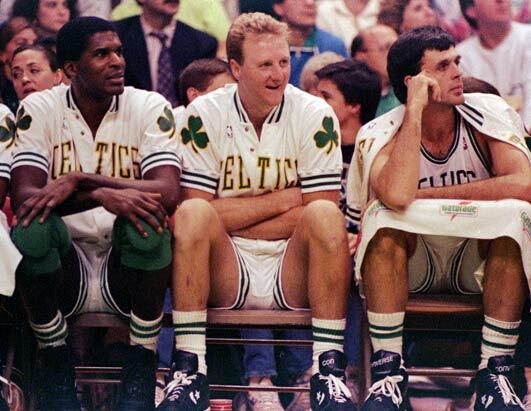 Danny Ainge has been on record saying that he believed that legendary Celtics patriarch Red Auerbach had waited too long before moving on the last great Celtic’s “big three” of Larry Bird, Robert Parish and Kevin McHale. That Celtics team lost to the Detroit Pistons in consecutive years of 1988 and 1989 – ECF and first round respectively. Ainge was conscious that he faced the same dilemma. 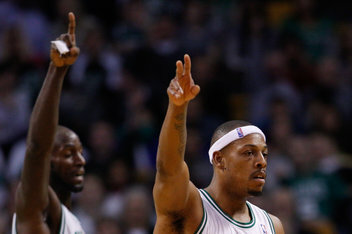 Garnett and Pierce probably have another couple of years left in the tank, but was it going to be worth it from the Celtics point of view? Garnett is due $11.5M next season and $12M the season after that. Pierce is only under contract for one more year, but at $15.3M. The Celtics, as they were composed last season, were clearly not going to get that much better with the return of Rajon Rondo. Ainge’s decision was to blow it up. Garnett and Pierce have, provisionally, been shipped to Brooklyn along with Jason Terry for Gerald Wallace, Kris Humphries, Kris Joseph, Keith Bogans, Marshon Brooks and Brooklyn’s first round pics in 2014, 2016 and 2018. Player-wise, that is horrific for Boston, Brooks aside. Wallace is a decent enough player, but is overpaid. The most interesting thing about Humphries? The trade doesn’t look too bad from a rebuilding standpoint in Boston. They’ll be able to be bad enough to be in the running for the no1 overall next year, particularly if Rondo is allowed to continue his career elsewhere. Some rumours on sports radio in the US this week suggested Phoenix might be one place for him – the Suns actually drafted Rondo before trading him to Boston, an understandable move when you remember that they had Steve Nash at that time, a stupid move when you put it alongside just about any Phoenix draft move since Amare Stoudemire. Tanking isn’t totally new to the Celtics; they were after Tim Duncan back in 1997 and ended up 15-67 in their pursuit of him, the 16.7% winning percentage their worst in franchise history. They ended up with the third pick and Chauncey Billups. It wasn’t a great historical draft, to be fair to the Celtics, and if Rick Pitino hadn’t failed to come to terms with Billups’s playing style, the selection would have been about as good as it got for any team – Duncan and perhaps Tracy McGrady aside. The key for the Celtics will be to be as bad as they can all season long. Gerald Wallace is exactly the sort of player who is used to tanking, after spending many seasons in Charlotte, but is good enough to bring the Celtics into the high lottery – picks that wont really do them any good in the long term. If you’re going to tank, you need to tank properly. If I were in charge at Boston, I would use my amnesty clause now – the only eligible players left are Avery Bradley and Rajon Rondo – and try to shift Wallace, possibly trade Rondo for picks, try as hard as I could to get shot of some of the other clowns they’ve acquired and just cruise to the lowest possible finish I could muster. It wont be nice for the fans and, of course, there’s no guarantee you actually win the draft lottery – only three worst-placed teams have ever won the lottery – but the Celtics have an opportunity to become a young and exciting team only one year removed from the Garnett and Pierce era and I think they should take it. There is also the question of whether the trade really any better for Brooklyn? The Nets are clearly adopting a “win now at all costs” strategy, one that many had assumed Boston had adopted back in 2007 – one that worked surprisingly quickly for the Celtics. The Nets, unless they are able to acquire picks via trade, won’t be selecting anyone in the first round of next years “greatest draft since sliced bread” (let’s not be too hasty here, Andrew Wiggins might be legit but a year is a long time, just ask Shabazz Muhammad…that’s not a joke about him lying about his age, either!) but they do currently have their own picks in 2015 and 2017’s first rounds. How old? Are you sure? The real question is: can the Nets win now? The answer for me is no. I don’t see Pierce and Garnett really contributing at all that high a level for another full season. The Nets don’t have anything outside of their starting five, as impressive as that now is – and you could debate the merits of Joe Johnson vs, say, Danny Green given their respective salaries (Johnson gets $21.5m, $23.2M and $24.9M in the next three seasons, Green is due $3.8M and $4m in the next two) and what they really give a team. Is Joe Johnson really six-seven times better than Green? Then there’s the question of how a scoring and egotistic point guard like Deron Williams fits with Pierce. For me, the Celtics are the winners in this trade, but it will take one long painful season to realise that fact. It is also crucial that they recruit well at head coach. Former Irish international Jay Larranaga has been mooted as one possible replacement for Rivers, but they will need to think very carefully about who is the right man to rebuild. They can basically give their new coach a free pass for a full season, so why not bring in somebody for the long term? It will be a long season for the Celtics, but it could be a long four or five seasons for the Brooklyn Nets. The only benefit they will definitely get is increased ticket sales and increased jersey sales. Perhaps that’s all they really wanted in the first place?